I was feeling super meh about doing my nails one week and decided to google “striped nail art designs” when this manicure by Paulina’s Passions popped up. I wanted to do something similar and here’s what I came up with using Pretty & Polished Weather the Storm, Polish ‘M Festival of Fall, and KBShimmer Poppy Kisses. I started off with Weather the Storm on all fingers except my thumb and ring finger. This is a stormy grey-blue dusty creme. Good formula, though I needed 3 coats for evenness. This is 3 coats plus top coat. On my thumb and ring finger, I used Festival of Fall. This is a “teal leaning dark blue base with blue/green/gold duochrome shimmer, galaxy holo, magenta holo shreds and multi-iridescent flakies“. This is 3 coats plus top coat. 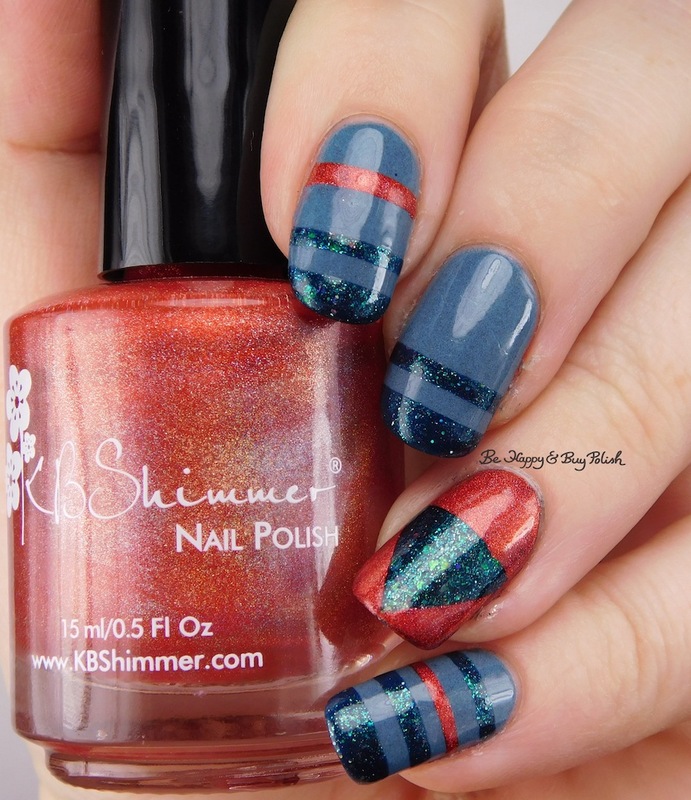 Then I used striping tape and KBShimmer Poppy Kisses to create the rest of the manicure. Some great stripes you created. I really like the look of both base polishes too.